I was sitting on a blanket in a screen tent in the back yard, honoring the earth and all her creatures, when during my prayers, a cardinal started singing, and came to perch on the ground right near the tent. I felt so thankful for that visit. I was pondering the big questions of my heart. I was asking, What is my greatest hope? And my heart answered, I hope that we find a way to live in harmony with all life on the earth, that our spirits wake up to experience the unity of all life, that we might join in that beautiful dance. But I also asked, What is my greatest fear? My heart answered, I am afraid that the greedy and powerful will kill all the trees, pollute the oceans, and destroy the animals and the people. I am afraid that humankind is broken beyond restoration, so cut off that we cannot find our way back to the unity. And so my prayer was a prayer to find wholeness, to find joy. When the cardinal started to sing so close by, it reminded me of the magic of being outside, the place where my hope is restored. It also reminded me of the magic of waking up at dawn, the time when the cardinal and a host of other birds sing their most beautiful songs. They create together a dawn chorus. I first learned about the magic of dawn from my Wampanoag friend gkisedtanamoogk. He had told me that the eastern peoples, called the Wabanaki, believed that dawn was the most sacred time of the day—the name Wabanaki means people of the first light, the first light of the sky before the sun rises over the horizon. This time was considered the best time to pray, to commune with the earth and the spirits within the earth. 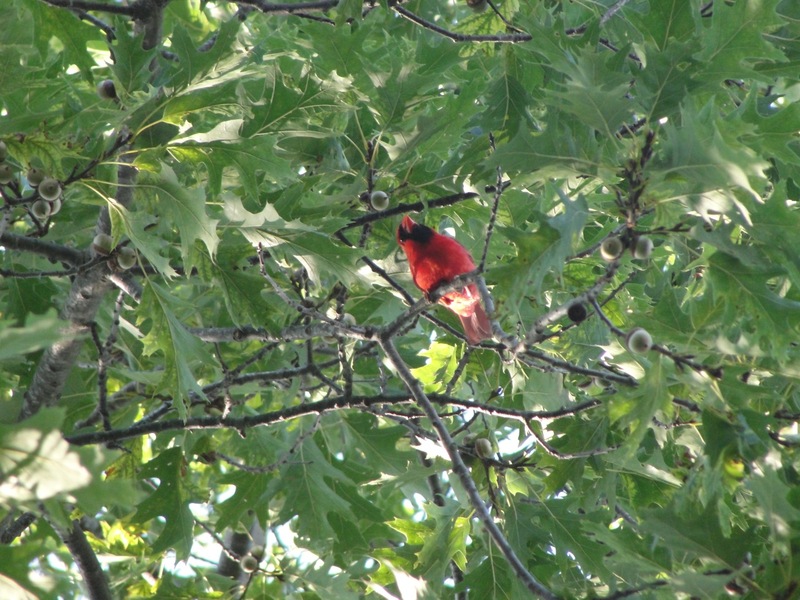 A few days later, I woke early, and heard a cardinal singing outside my window, and that called me outside again. So I went out and sat on my blanket and tried again to open my heart to the world all around me. When I look at any writing in English, even the tag on the edge of the screen tent, I cannot help but read the writing there. Yet when I look at the plants or the mushrooms in our yard, I realize I do not know how to read the earth. I don’t know the names of many plants or their characteristics. Our species has become so isolated, so alone in our own thoughts and works. I wish I had a guide to teach me how to read the earth. 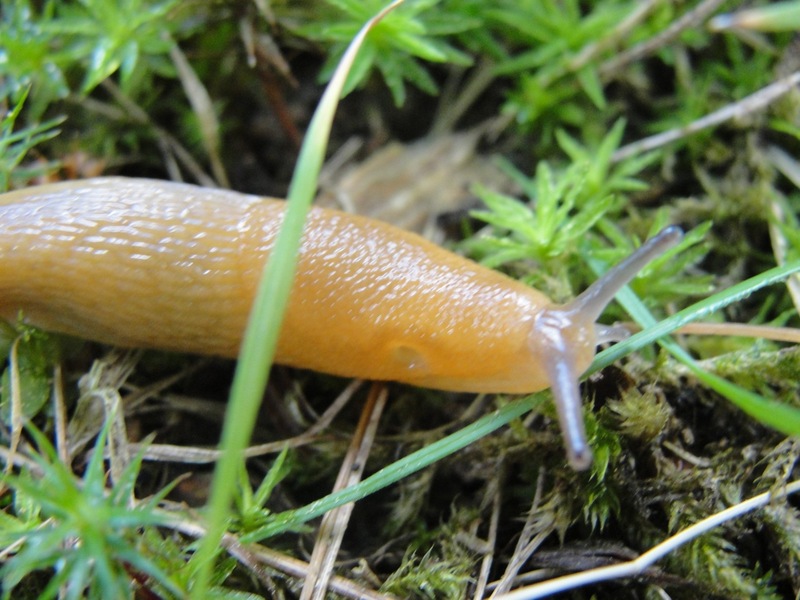 I saw a small slug moving slowly through the grass. As I was watching it, I wondered what it was reading about the earth, what chemical messages it found in the small trails through the grass. It was on its way toward a mushroom. I took photos of its small golden body, tried to pay attention to its slowness and intention as it climbed the mushroom stem. 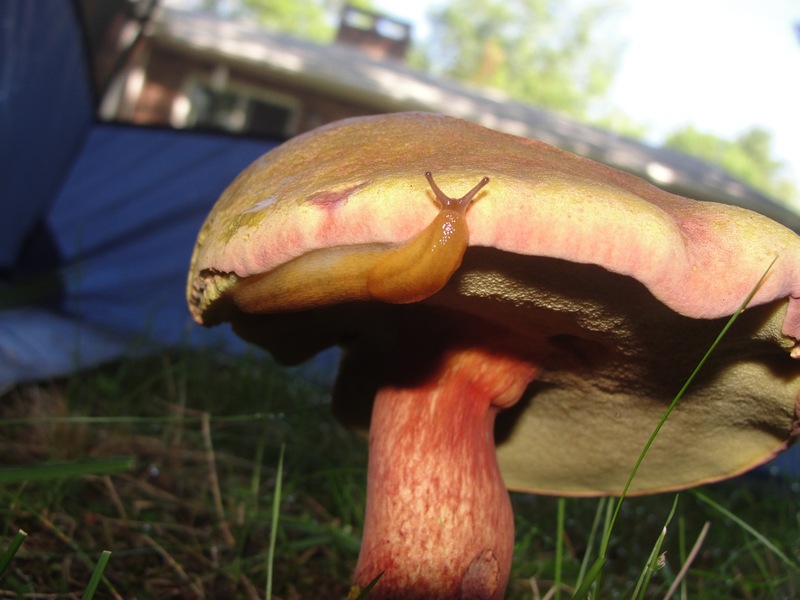 Even a slug can be a teacher. Listening to the cardinal singing, these words came into my heart: Whatever you do there is beauty in it: the work, the rest, the prayer, the play, the listening. Awaken to beauty, be present to it, the hidden beauty of the ordinary is like the muted beauty of the female cardinal. Dispel sadness, awaken to beauty and joy. This entry was posted in Awake to Earth and tagged Beauty, Cardinal, Dawn, Dawn Chorus, Earth, gkisedtanamoogk, Mushroom, Slug, Spirituality. Bookmark the permalink.